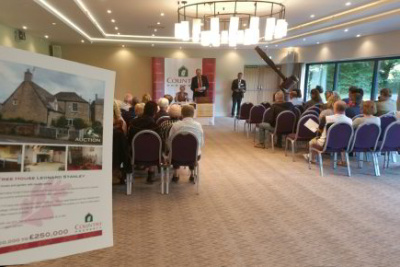 Building upon their string of property auction successes, auctioneer Nick Cragg and his team conducted a text book auction sale of Yew Tree House, Leonard Stanley, Gloucestershire at Stonehouse Court Hotel on Thursday 20th July. Yew Tree House has two flying freeholds and the price guide was set to reflect the extent of work required to this Listed Grade 2 building. The auction was very well attended and there were several bidders. The hammer was finally brought down at the closing bid of £236,000 - which reflected well upon the auctioneers’ realistic quoted guide price range of £200,000 to £250,000. Auctioneer Nick remarked his vendors were extremely happy with the result, and with the closure and relief the auction method of sale had given them to close their fathers estate, with exchange of contracts on the fall of the hammer, deposit taken and contracts exchanged, and with completion of sale to take place 20 working days later - or sooner if the buyer would like to settle up the balance of the purchase price and take occupation to start work sooner. Country Property welcome auction opportunities and are pleased to offer impartial auction advice to prospective vendors and family estates, based upon years of practical auction and surveying experience.